Painting your house yourself is a great way to save yourself some cash when it’s time to spruce up your interior or exterior space. Adding a new coat of paint is a great way to cover up any imperfections in the structure, seal out the heat and cold, and make your home look as good as new. If you do it right, you’ll save time and money, but not all do-it-yourself actions are equal. Since you’re taking on this responsibility, it’s up to you to make sure you’re using your time well and not cutting corners that could lead to expensive and time-consuming repairs and re-dos. Letting your paint job go too long before you’ve started it is a classic way to spend too much when you do get around to it. Ideally, especially for exteriors, you want to start your repainting job before you start to see signs of wear such as peeling or fading paint. A great way to trim your DIY paint job expense is to paint over your existing color with the same or similar color. You might get away with needing only one coat this way. Deep, darker colors also don’t spread and cover as willingly as lighter colors, so consider using those deep reds and night blues for the trim or accent areas instead of interior or exterior walls. You can trim a few painting tasks that might take excess amounts of time and effort, but aren’t actually that important to you. Ceilings and closet interiors are usually the first to get put off. 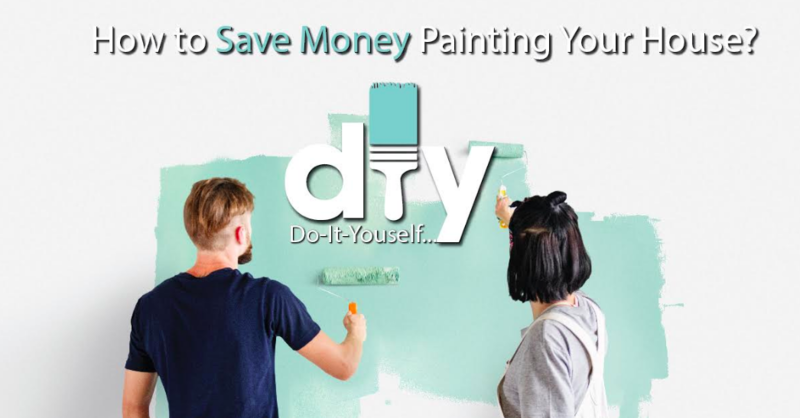 Now that we’ve gone over a few basic ways to avoid spending too much, let’s look at wise investments that might cost more up front, but will save you time and money as your DIY paint job rolls on (get it?). Going to the paint store and selecting the cheapest option for your job might seem like the best way to cut costs, but in the long-run, investing in quality paint is less expensive. Quality paint doesn’t fade or peel as fast, and it prevents damage to exterior areas better. You won’t have to repaint interior or exterior areas as often, either. Making sure you have the right brush for the job is crucial before you get started, but what about rollers? Most amateur painters think of rollers as just another generic piece of equipment that only differs in size. Cheap rollers, however, can leave fibers on your wall, they don’t hold enough paint to be efficient with your motion, and they can generally slow you down by being difficult to use. Also, make sure your roller’s nap length is appropriate for your application. Most amateur painters wipe the brush on the lip of the paint can. Professionals know better, however. Dip the bristles one to two inches into the paint, then slap the brush on the side of the container to remove all the paint you won’t need. This will save you time and paint while giving you a more even finish. These are the best ways to minimize your DIY painting budget and will save you time.